1. 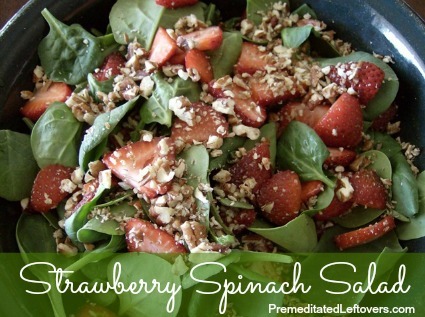 In a large bowl, toss spinach, strawberries, and nuts. 2. Add raspberries, vinegar, sugar, mustard to a blender or food processor and puree until smooth. 3. Slowly add oil until well combined. Variation: To make a creamy raspberry vinaigrette, I stir in 2 tablespoons of raspberry yoghurt. Note: If I am serving this salad to a large crowd, I coat the salad with Raspberry Vinaigrette Dressing If it is just my family, I serve the dressing on the side, because once the salad is coated with dressing, the uneaten spinach will wilt and then I canít have the leftovers for lunch.